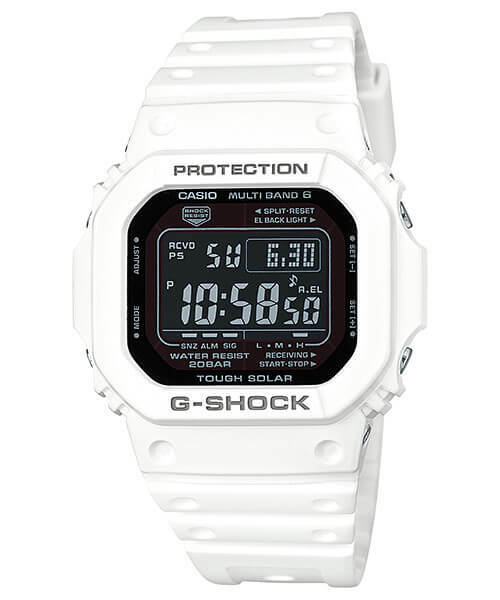 Just in time for summer, the white G-Shock GW-M5610MD-7 is now being sold by Amazon.com. This classic square origin model was originally released in Japan in November 2015 and remained a Japan-only model until now. It’s perfect for those who desire a white square G-Shock and don’t want to sacrifice functionality with a lesser DW-5600 model. The GW-M5610MD-7 has Tough Solar power and Multi-Band 6 radio time syncing for maintenance-free use. Other benefits over the DW-5600 include world time, 4 alarms and 1 snooze alarm, and a “full auto” EL backlight (that activates the backlight with a turn of the wrist and only in dark settings). It also has a reverse LCD display for a high-contrast style. With square mania in full force during this 35th Anniversary year, the GW-M5610MD-7 is an affordable and unique selection.